how do you sum up the first group of three elements (0+3+7), the second group of three elements (22+6+71), the third group (1+0+9), and so on and so on, without using a Repeat node? On the emitter, get the texture map and use Color to Brightness to set an attribute. You’ll use this attribute to filter the Generate Sample Set. 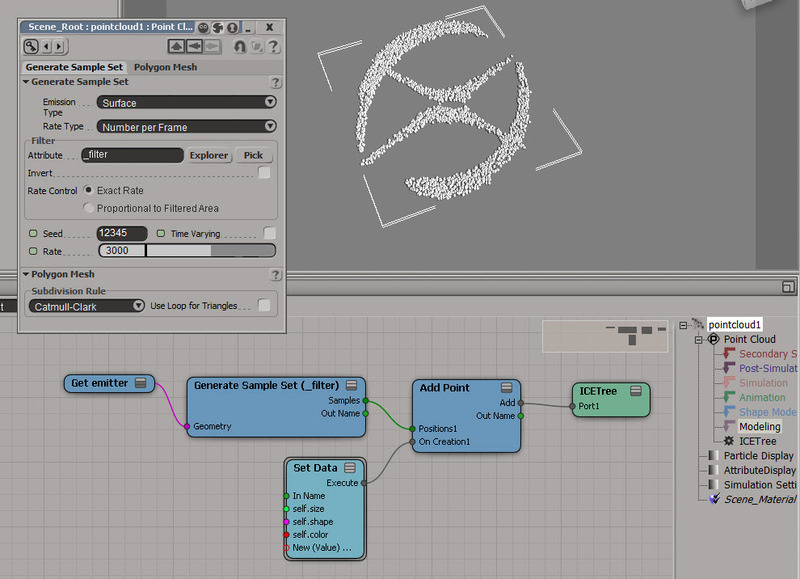 On an empty point cloud, use Generate Sample Set to add points. Use the emitter attribute to filter the added points. Here’s an ICE tree that removes all duplicate elements from an array. 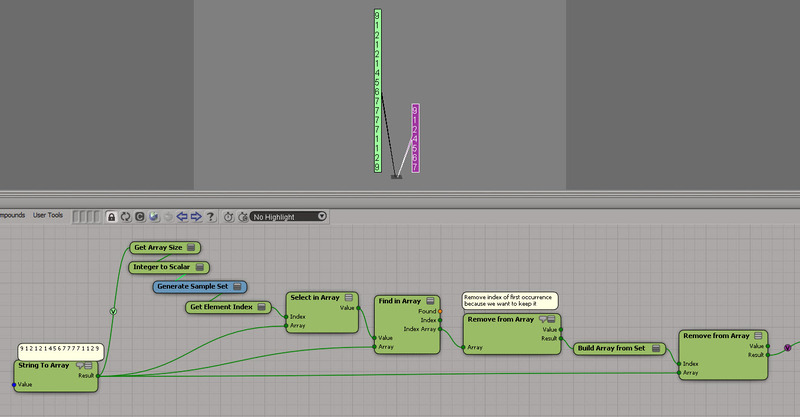 It uses Generate Sample Set, so there’s no repeat nodes. But it relies on the fact that you can feed in an array of indices into Remove from Array, and Remove from Array doesn’t care if that array of indices itself contains duplicate. So, if you plug the array [1,1,1,2,2,2,3,3,3] in the Index port, Remove from Array will nicely remove elements 1, 2, and 3 with no complaints. Hat tip to Oleg who posted this tip on the mailing list some time ago. The basic ideas is that instead of looping over an array with a Repeat with Counter, you use Generate Sample Set to get a data set, and you do everything in a per-generated element context. As an example, let’s revisit the problem of taking one array and creating a new array where each element is the sum of the elements before it.